The constant amplitude database; Residual stresses; Variable amplitude loading and testing; Tests under two and three level loading; The influence of spectrum shape and block length; The influence of narrow and wide band loading; The influence of cycles of small stress range; Design for variable amplitude loading; More on the fracture mechanics approach – the effect of stress interaction. Fatigue is a mechanism of failure which involves the formation and growth of cracks under the action of repeated stresses. Ultimately, a crack may propagate to such an extent that total fracture of the member may occur. To avoid fatigue it is essential to design the structure with inherent fatigue strength. However, fatigue strength for variable amplitude loading is not a constant material property and any calculations are necessarily built on a number of assumptions. 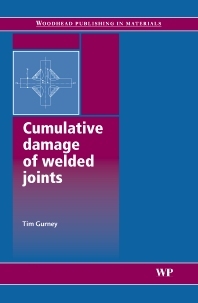 Cumulative damage of welded joints explores the wealth of research in this important field and its implications for the design and manufacture of welded components. After an Introduction, chapter two introduces the constant amplitude database, which contains results obtained in test conditions and which forms the basis of the basic S-N curves for various types of joint. Chapter three discusses the influence of residual stresses which can have a marked effect on fatigue behaviour. Chapter four explores variable amplitude loading and the problem of how information from laboratory tests, obtained under constant amplitude conditions, can be applied to the design of structures for service conditions. This problem is further investigated in the next chapter which is devoted to two and three level load testing. Chapters six, seven and eight look at the influence that the variety of variable loading spectra can have on fatigue strength, whether narrow or wide band loading or cycles of small stress range. Taking all of this knowledge, chapter nine discusses structure designs. Cumulative damage of welded joints is a comprehensive source of invaluable information for welding engineers, supervisors, inspection personnel and designers. It will also be of great interest for academics working in the fields of structural and mechanical engineering. Welding engineers, supervisors, inspection personnel and designers; Academics working in the fields of structural and mechanical engineering.